Sugar alcohol sweeteners (also known as polyols) usually contain less calories than regular sugar, and have virtually no impact on blood sugar and dental health. Sounds great, except for some disclaimers: since they can't be digested in the human digestive system, these sweeteners can cause gut issues such as flatulence, bloating and diarrhea. In addition, most of these sweeteners are excreted in the urine, which increases the amount and frequency of urination. This increased urination will result in a higher loss of body minerals such as calcium, magnesium and potassium and possibly cause muscle cramping. At higher intake amounts, this effect is more pronounced, and in rat studies, has resulted in changes in kidney function and structure. (See this reference: Nutrient Requirements of Laboratory Animals,: Fourth Revised Edition, 1995, page 22). Some people with blood sugar issues may experience blood sugar spikes after eating these sweeteners, but this is an individual response. Since all of these types of sugar substitutes contain some calories and carbs, be sure to count them into your daily totals if you are on a low carb diet plan. This is a relatively new sugar alternative. Not technically a sugar alcohol, allulose is being studied and marketed for its strong ability to lower blood sugar and reduce inflammation in fat cells, effects which make it highly useful in treating diabetes and insulin resistance. (See this paper. ) And here's an interesting effect of this sugar substitute...a study claims that the consumption of allulose enhanced energy metabolism in both humans and animals. You can learn more about allulose here. In practical use, it is similar in texture and taste to sugar and is eliminated via urination, so gastrointestinal effects are minimal, unless you eat more than 0.4 g/kg body weight. The pros and cons are similar to erythritol, see below. It comes in liquid and powder form and it's expensive. Results from several different recipe tries were good, but I did notice that the muffin batter I made was not as sweet after I baked it. I purchased allulose through a company called Lang's Chocolates - Keystone Pantry. Erythritol has about 3/4 the sweetening power as regular sugar, with only a tenth of the calories. One cup of erythritol contains about 10 grams of carbohydrate, and 40 calories. This sugar alcohol is best used in conjunction with other sugar substitutes such as stevia, sucralose and glycerin. Lauren over at the Healthy Indulgences Blog suggests using erythritol in desserts which are of a moist consistency for best results, since erythritol does not attract moisture as regular sugar and some other sweeteners do. Hence, it has a tendency to dry out the foods to which it is added. I compensate for this by adding a little xanthum gum and cream cheese to baked recipes. Pros: Erythritol is absorbed in the small intestine, so it has less of a laxative effect than other sugar alcohols. It also has no effect on dental health, and has been shown to prevent tooth decay in some studies. It has no effect on blood sugar or insulin. Cons: Large doses (over 50g) of this sugar alcohol can cause hives, stomach rumbling and nausea. And as with all sugar alcohols, it increases urination and thirst. Personally, I love the taste of erythritol, but even in small amounts, it increases my bathroom time and later in the day, I get cramps in my feet and calves, presumably because of mineral loss. I also notice that my blood pressure increases if I increase my intake of this sweetener. Glycerol has about 2/3 the sweetening power as regular sugar. It is soluble in water, and therefore works well with other drier sweeteners such as erythritol and xylitol. However, it contains slightly more calories than sugar, having 27 calories per teaspoon versus sugar's 20 calories. It is commonly used in liquid over the counter drug products such as cough syrup and liquid acetaminophen. Pros: it has a negligible effect on blood sugar levels in normal people (diabetics may see a blood sugar effect after consumption), and does not have a detrimental effect on dental health. Cons: In May of 2007, the FDA issued warnings to food and drug manufacturers to test their supply of glycerin for toxins. Large number of people have died in countries outside the US after ingesting products made with the tainted glycerin. Isomalt has about half the sweetening power as regular sugar, with half the calories. It retains its sweetening power under heated conditions, so it can be used in baked and cooked desserts. Isomalt is typically blended with other sweeteners such as acesulfame potassium or Splenda, to increase it's sweetening power. Pros: it has little effect on blood sugar levels, and does not have a detrimental effect on dental health. Cons: Can cause serious gastrointestinal distress - lots of gas and bloating - if consumed in large amounts (over 50g/day). Over time, adapatation may lessen this effect. Lacitol has less than half the sweetening power as regular sugar, with about half the calories. It is manufactured from diary whey, and it has prebiotic potential, meaning it increases the good bacteria in the gut. It is very stable, and retains its sweetening power under heated conditions. Lactitol is typically blended with other sweeteners to increase it's sweetening power. Pros: it barely raises blood sugar levels, and is safe for your teeth, plus it increases the good bacteria in the gut, contributing to better colon health. Cons: has a laxative effect, and it actually used in a drug for constipation. Maltitol slightly less sweetening power as regular sugar, with about 3/4 the calories. It's made from corn starch, and is used in many diabetic or sugar free commercial products, especially sugar free chocolates, because of it's ability to carmelize and the creamy texture it imparts. Pros: Does not have a detrimental effect on dental health. Cons: Has a pronounced effect on blood sugar levels, and a glycemic index about the same as kidney beans. It can also cause gas and bloating, and severe diarrhea if consumed in large amounts (over 100g/day). Polydextrose is not a pure sugar alcohol, but a combination of dextrose (corn sugar)and sorbitol. It is only slightly sweet and is mostly fiber. It is used mostly to provide bulk and fiber to baked goods. Pros: Polydextrose is actually good for your colon and it slows blood sugar response to carbohydrates. This study showed that it has the same effect as vegetable fiber on colon health. It also has no detrimental effect on dental health. Cons: it can have a laxative effect for some people. Sorbitol has about 3/4 the sweetening power as regular sugar, with about 2/3 the calories. It's a natural substance, and the human body makes sorbitol out of the glucose we consume. 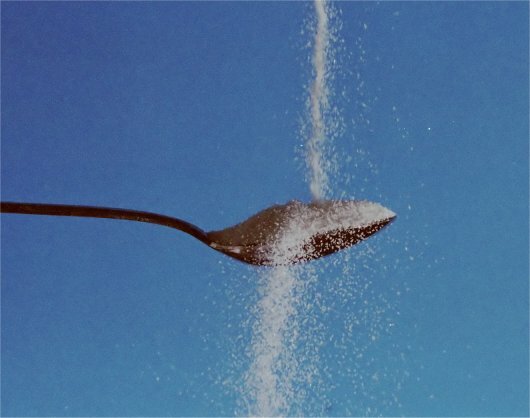 Some studies indicate that excess sugar consumption results in excess sorbitol in the body, which causes glycation damage to body organs and systems. Sorbitol is also found naturally in many fruits (think prunes). Pros: it has a slight effect on blood sugar levels, and does not have a detrimental effect on dental health. Cons: Has a strong laxative effect, can cause severe diarrhea, and can aggravate gastrointestinal conditions such as IBS and Crohns. People have gotten very sick just from the chronic consumption of sorbitol. It can be absorbed through the skin as well, and I have read that people with epilepsy on a ketogenic diet have to avoid skin products made with sorbitol, else the carbohydrate will trigger seizures. Xylitol has about the same sweetening power as regular sugar, with about 2/3 the calories. One cup has 96 grams of carbohydrate, and about 460 calories. Xylitol is made from plant fiber and it has some unexpected benefits. Pros: it has little effect on blood sugar levels, and does not have a detrimental effect on dental health, and it has some other surprising health benefits. Cons: Has a laxative effect, but not as strong as sorbitol. As with all sugar alcohols, it increases urination and thirst. In addition, when ingested in large amounts, xylitol can elevate uric acid levels in the blood (which could lead to kidney stones), and it has been associated with liver damage when given via intravenous method. Also, don't let your dog eat any foods containing xylitol. It can cause severe low blood sugar in dogs, and has been shown to cause death in smaller breeds. My view of these sugar alcohol products is that they may be a good substitute for high carb sugars occasionally. The problem with these types of sweeteners is that they have been shown in studies to be "antiketogenic", meaning that they interfere with the process of ketosis, just as eating "regular" carbohydrates does. Since ketosis is the beneficial fat burning process associated with eating a ketogenic, low carb diet, using these sweeteners may reverse what you are trying to accomplish. Some people may be more sensitive to them than others, so you'll have to check your own results, as your mileage may vary. All of my books are available in electronic PDF, and now in paperback on Amazon!